In the current global marketplace, competition for products and services has never been higher. Consumers have multiple choices for many very similar products. Therefore, many manufacturing companies are continually striving to introduce completely new products or break into new markets. Sometimes the products meet the consumer’s needs and expectations and sometimes they don’t. The company will usually redesign the product, sometimes developing and testing multiple iterations prior to re-introducing the product to market. Multiple redesigns of a product are expensive and wasteful. It would be much more beneficial if the product met the actual needs and expectations of the customer, with a higher level of product quality the first time. Design for Six Sigma (DFSS) focuses on performing additional work up front to assure you fully understand the customer’s needs and expectations prior to design completion. DFSS requires involvement by all stakeholders in every function. When following a DFSS methodology you can achieve higher levels of quality for new products or processes. Design for Six Sigma (DFSS) is a different approach to new product or process development in that there are multiple methodologies that can be utilized. Traditional Six Sigma utilizes DMAIC or Define, Measure, Analyze, Improve and Control. This methodology is most effective when used to improve a current process or make incremental changes to a product design. In contrast, Design for Six Sigma is used primarily for the complete re-design of a product or process. The methods, or steps, used for DFSS seem to vary according to the business or organization implementing the process. Some examples are DMADV, DCCDI and IDOV. What all the methodologies seem to have in common is that they all focus on fully understanding the needs of the customer and applying this information to the product and process design. The DFSS team must be cross-functional to ensure that all aspects of the product are considered, from market research through the design phase, process implementation and product launch. With DFSS, the goal is to design products and processes while minimizing defects and variations at their roots. The expectation for a process developed using DFSS is reportedly 4.5 sigma or greater. When your company designs a new product or process from the ground up it requires a sizable amount of time and resources. Many products today are highly complex, providing multiple opportunities for things to go wrong. If your design does not meet the customer’s actual wants and expectations or your product does not provide the value the customer is willing to pay for, the product sales will suffer. Redesigning products and processes is expensive and increases your time to market. In contrast, by utilizing Design for Six Sigma methodologies, companies have reduced their time to market by 25 to 40 percent while providing a high quality product that meets the customer’s requirements. DFSS is a proactive approach to design with quantifiable data and proven design tools that can improve your chances of success. DFSS should be used when designing a completely new product or service. DFSS is intended for use when you must replace a product instead of redesigning. When the current product or process cannot be improved to meet customer requirements, it is time for replacement. The DFSS methodologies are not meant to be applied to incremental changes in a process or design. DFSS is used for prevention of quality issues. Utilize the DFSS approach and its methodologies when your goal is to optimize your design to meet the customer’s actual wants and expectations, shorten the time to market, provide a high level of initial product quality and succeed the first time. As previously mentioned, DFSS is more of an approach to product design rather than one particular methodology. There are some fundamental characteristics that each of the methodologies share. The DFSS project should involve a cross functional team from the entire organization. It is a team effort that should be focused on the customer requirements and Critical to Quality parameters (CTQs). The DFSS team should invest time studying and understanding the issues with the existing systems prior to developing a new design. There are multiple methodologies being used for implementation of DFSS. 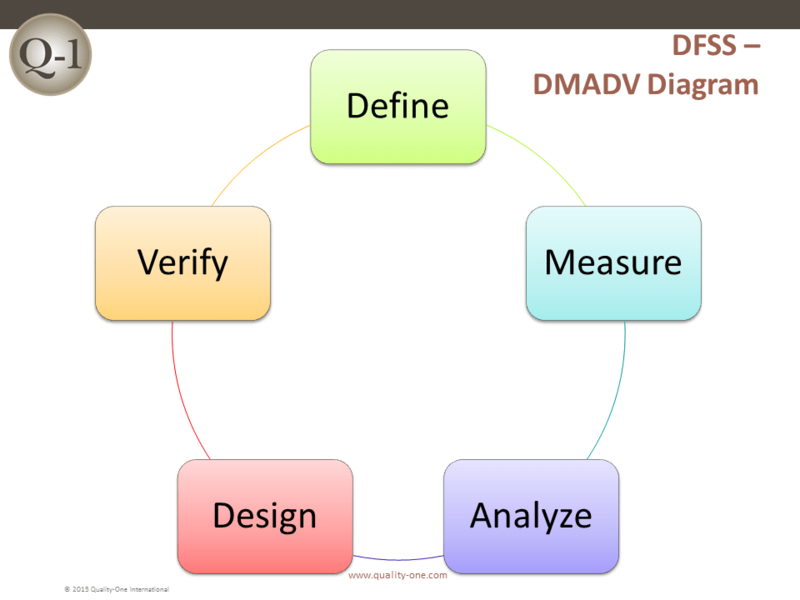 One of the most common techniques, DMADV (Define, Measure, Analyze, Design, Verify), is detailed below. The Define stage should include the Project Charter, Communication Plan and Risk Assessment / Management Plan. Project timeline or schedule with well-defined gates and deliverables for each gate review. Who is the primary contact on the team that is responsible for communicating? What are the main goals for the communication process? When and how often will the communication occur? What methods will be used for communication? In the Analyze Phase, the customer information should be captured and translated into measureable design performance or functional requirements. The Parameter (P) Diagram is often used to capture and translate this information. Those requirements should then be converted into System, Sub-system and Component level design requirements. The Quality Function Deployment (QFD) and Characteristic Matrix are effective tools for driving the needs of the customer from the machine level down to component level requirements. The team should then use the information to develop multiple concept level design options. Various assessment tools like benchmarking or brainstorming can be used to evaluate how well each of the design concepts meet customer and business requirements and their potential for success. Then the team will evaluate the options and select a final design using decision-making tools such as a Pugh Matrix or a similar method. FMEA is a popular tool used to identify potential design risks, identify key characteristics and develop a list of actions to either alter the design or add to the validation plan. Computer simulation and analysis tools can allow the team to work through the processes and understand the process inputs and desired outputs. The design phase is complete once the team has developed a solid design and validation plan for the new product or process that will meet customer and business requirements. One popular tool is Design Verification Plan and Report (DVP&R), which documents the validation plan and provides a section for reporting results. During the Verify Phase, the team introduces the design of the product or process and performs the validation testing to verify that it does meet customer and performance requirements. In addition, the team should develop a detailed process map, process documentation and instructions. Often a Process FMEA is performed to evaluate the risk inherent in the process and address any concerns prior to a build or test run. Usually a prototype or pilot build is conducted. A pilot build can take the form of a limited product production run, service offering or possibly a test of a new process. The information or data collected during the prototype or pilot run is then used to improve the design of the product or process prior to a full roll-out or product launch. When the project is complete the team ensures the process is ready to hand-off to the business leaders and current production teams. The team should provide all required process documentation and a Process Control Plan. Finally, the project leaders, stakeholders and sponsors complete the project documentation and communicate the project results. The entire team should then celebrate project completion. DMADV seems to be the most prominently used process but as mentioned previously it is not the only option. Even DMADV has a variation sometimes utilized, known as DMADOV, which adds the step identified as Optimize or Optimization. This step can be beneficial for developing new or revised business procedures. An additional variation of DFSS is known as DCCDI (Define Customer and Concept, Design, Implement). DCCDI has many similarities with DMAVD and contains similar define, measure and design stages. Furthermore yet another variation is IDOV (Identify, Design, Optimize, Verify). The IDOV method also adds the optimization phase. Companies could possibly implement any one of these various methods according to their business culture and needs. For additional information regarding Design for Six Sigma, please contact our Subject Matter Experts (SME) at Quality-One and will help you successfully implement DFSS! Quality-One offers Quality and Reliability Support for Product and Process Development through Consulting, Training and Project Support. Quality-One provides Knowledge, Guidance and Direction in Quality and Reliability activities, tailored to your unique wants, needs and desires. Let us help you Discover the Value of DFSS Consulting, DFSS Training or DFSS Project Support.